If you’ve ever tried to lose weight, chances are, you’ve been through a weight loss plateau. Here are 10 practical and kind ways to help your body break through a weight loss plateau. When I began my weight loss journey I was excited and committed and ready for change. I was losing consistently and in a healthy range (1-2 pounds per week) and I went months before experiencing a gain on the scale. And then one day, it changed. I was doing what I’d been doing to achieve success, but the scale wasn’t reflecting my efforts. To break through a weight loss plateau is frustrating, but if you have ever tried to lose weight, more than likely, you’ve been through one. We have two options when we face a plateau: give up or push through. I’m going to give you some really practical ways to push through. You won’t read any crazy weight loss gimmicks on my blog, ever. 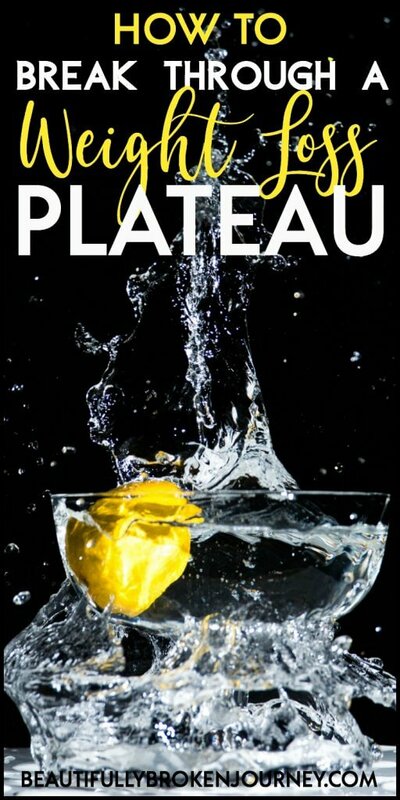 Just honest, healthy and kind ways to help you through your plateau so you can begin losing again and get you closer to reaching your healthy body weight. Here are 10 things to consider when trying to break through a weight loss plateau. Get back to basics When we begin to lose weight we are usually excited and anxious to do ALL THE THINGS. We want to do everything perfect and on plan. Then, after a while, it’s not so exciting anymore. Maybe we stop tracking, maybe we drink less water, maybe we aren’t so diligent on working out. When a plateau hits, a good first step is to get back to basics. I am on the Weight Watchers plan so for me that means I need to start weighing and measuring my food again and maybe stop nibbling on my boys snacks (because those darn little goldfish add up quickly!) For me, it means being honest about tracking, and I don’t care if I go into my weekly points, I just need to be honest about the food I’m eating so I have the information I need so when the scale isn’t moving I can start trying to figure out why. I think every few months it’s a great idea to get back to basics. Sometimes we can get wrapped up in the latest recipe fad, or doing what everyone else seems to be doing, and we need to remind ourselves that our journey’s all look different and what works for some doesn’t work for all, and it’s time to figure out what works best for you. Switch up your workout Have you been doing the same workout since you began losing weight? If so, it might be time to switch it up. When you do the same workout all the time your body isn’t challenged and you are working the same muscles most likely. It can be as simple as if you walk, change your path to include one with more hills, or maybe walk an extra half mile. If you are spinning 3 times a week, add in strength training. It’s great to love your workout, but don’t be afraid to incorporate something new that might help kickstart your metabolism and help break you out of your plateau. I go to Bar Method 5x a week, but I’ve started adding in a day of spinning and decreased Bar Method to 4x a week… just a subtle change but something I’m hoping will help kickstart the plateau I am in now, too. Get more sleep Our bodies need time to recover. If we aren’t getting adequate sleep, they aren’t having time to recover from our workouts and environmental stress. This is an area I really struggle with. I have a 2 year old that is going through a stage that sleeping through the night seems nearly impossible. Sleep is hard to come by, especially if you are a parent. Thankfully my 6 year old always sleeps through the night! But, try to find a way to add even an additional 30 minutes of rest each night. I am trying to turn off my phone by 10pm so I don’t waste time that I could be sleeping mindlessly scrolling on social media. Incorporate new foods Do you eat the same thing every day for breakfast? Do you take the same lunch everyday? If so, don’t be afraid to try something new! Challenge yourself to try one new food each week. It will keep your journey exciting and then food choices won’t seem so boring. Even though you are losing weight, you should love the food you eat! Please stop eating foods you hate just because you think you have to in order to reach a healthy weight. Life is too short to waste it on food we don’t enjoy! If you are in a recipe rut, try searching for new recipes on Pinterest… there are so many amazing food bloggers out there making delicious healthy food! 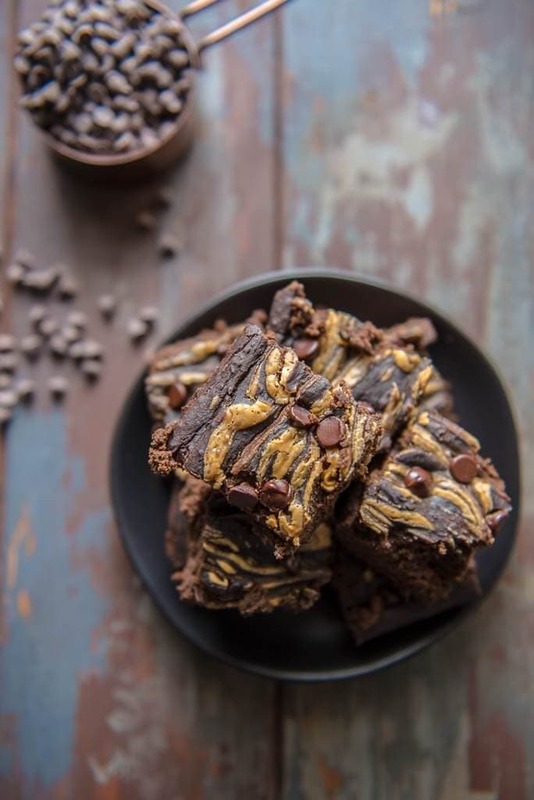 Speaking of, have you tried my Black Bean Brownies with Peanut Butter?? 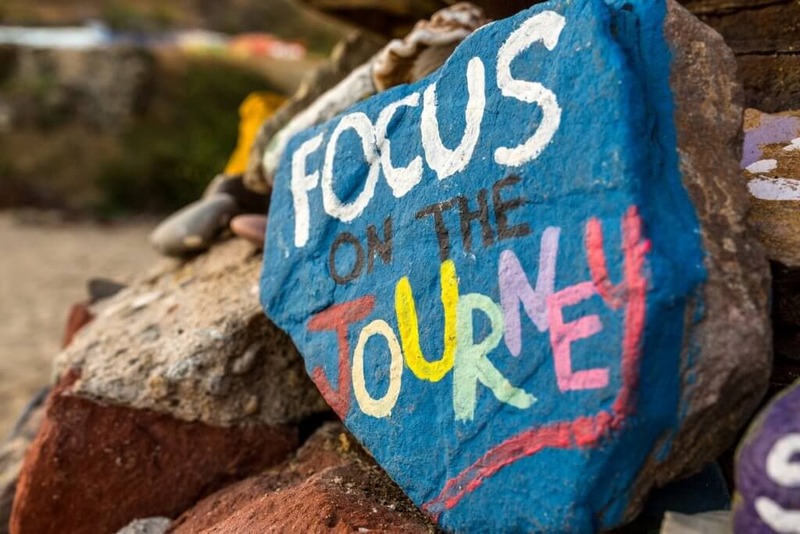 Focus on Non Scale Victories When the scale isn’t moving, shift your focus. Focus on all the positive and healthy changes you’ve made so far. Have you been more active? Have you incorporated more wholesome foods? Have you learned to listen more to your hunger cues and only eat when you are physically hungry? Did you travel and you didn’t have to use a seatbelt extender? Have you been able to walk longer than you thought you could? These are just a few examples of non-scale victories that you can focus on instead of the scale. My favorite NSV (non-scale victory) was when I was able to wear my wedding ring again. I hadn’t worn it in 18 months and the day I was able to finally put it back on I was ecstatic. The number on the scale meant nothing to me on that day… and slipping my ring on again was priceless. Be patient Plateaus happen to just about everyone who has ever tried to lose weight. It’s part of the process. Having patience during the plateau allows you to adjust to your new lifestyle and really challenges your mindset. Learning to have patience with ourselves and this journey is not easy. We live in a society where we want a quick fix, but I’ve learned that nothing worth having is worth taking a shortcut to achieve. Any time I have gone on a crash diet or a cleanse or detox I’ve dropped the weight quickly, and I’ve put it on as fast as I lost it. I am not interested in a quick fix anymore, I am in this for the long haul. Therefore, I have learned to be patient with the process and know that I may lose slower than someone who is doing more dramatic systems, but I am doing it in such a way that will be long lasting. Be honest about your behaviors I’m including this because years ago, this was my problem. I would complain about not losing weight and I would tell everyone I was doing everything right… but behind closed doors I was binging. I am not including this to shame anyone. I am giving you the opportunity to look at your behaviors and ask yourself if they are healthy. Are you binging? Are you having one day a week that is a cheat day and eating everything in sight and ignoring your hunger cues just because it’s a “cheat day”? Are you eating to serve an emotional need or a physical one? I used to weigh in and then spend the rest of the day binging, but then get back on track the next day. That one day binge was doing a lot more harm than good on my body, my mind and my weight loss efforts. Your healthy lifestyle should include foods you love, which means you shouldn’t want to binge as much because you are incorporating them into your food plan already. Find a tribe Chances are, you aren’t the only one who is trying to create a healthier lifestyle. You probably have family, friends, co-workers, neighbors etc. who are trying to do the same. Connect with these people! Check in with them to share recipes, or new food finds. Find a workout buddy so you’ll have someone holding you accountable to go to the gym or just go out for a walk. 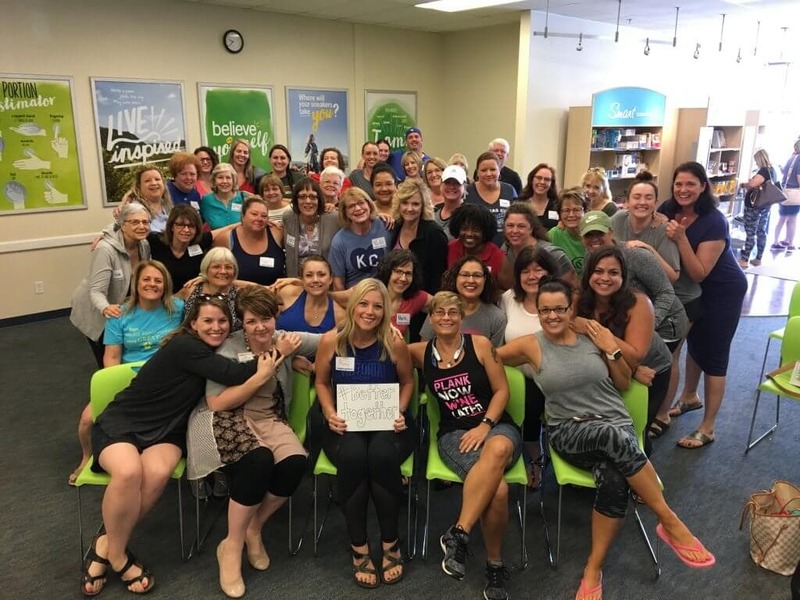 I go to Weight Watchers meetings and I know if I miss a meeting, at least one person will text and say, “I missed you!” If you don’t have people in your life who are trying to get healthy, I guarantee you can find a tribe online. I started sharing my journey on Instagram shortly after I started and I had no idea the amount of support I would find by searching #weightwatchers. In 2 years time I have made some amazing friends and relationships with people all over the country. Your tribe can help you refocus and remind you of your why when a plateau happens. Release negative self talk- I read a quote recently that said your body hears everything your mind says. Our minds are powerful. When you feel yourself talking negatively, try to reframe it and turn it positive instead. Tell yourself, “I CAN do this. I AM worth this.” Whether you think you can or you can’t, you’re right. Positive self talk is a game changer. It’s a lesson that is difficult for many of us, but the more we practice talk the more we will radiate positivity into every area of our lives. Manage stress- Life, motherhood, careers, finances… it can all become so overwhelming. If we are stressed our body releases more cortisol which makes it even harder to lose weight. You can read more about what that means here. What can you do to help manage the stress in your life? We are all going to be under stress, but it doesn’t have to be detrimental to our health. One thing I’ve started this year is making sure all the laundry is done on Sunday nights. This might seems small, but it means I don’t have to worry about that one household task during the week. We are set to go with clean clothes all week and I’m not panicking on a Wednesday morning when we are running late for school and my son tells me he has no pants… yes, I’m speaking from personal experience! Choose one area that is stressing you out and come up with one simple task to alleviate some stress this week. Losing weight is a journey. It usually doesn’t go exactly as we want it to go. It took me almost 2 years to lose 100 pounds. I wasn’t in a hurry. I gave myself a lot of grace and stayed committed to my journey regardless of what the scale says. The only way to fail is to give up… and I know you don’t want to do that. So, if you are in a plateau right now, stay focused, try a few of these tips and before you know it you’ll get through it and be so proud of yourself for staying the path to your healthiest life yet! I have hit a plateau and I’m going to use your suggestions to try to break thru this. Good luck, Cathy! I hope it helps! Just keep swimming!!! These are absolutely perfect and so true!!! Yes!! Great job Amy!! It’s a real pleasure reading your wonderful ideas and encouragement!!! I’m going to print this blog and hang it !!! Thank you so much, Sissy! Glad you are enjoying it! I sometimes have to have a blowout day to shake things up. It’s worked for those times the scale won’t budge. I’m a slow loser anyway but happy with any loss. I have a history with binge eating disorder so because of that I don’t encourage “cheat days” where you eat in excess. I do have days that I eat more than usual and higher calorie and higher fat foods, but I try not to turn them into a binge day. It can set me up for weeks of derailment. If that works for you and you are able to have a healthy relationship with food, then I’m glad it works for you.